The best way to get around the Cayman Islands is by car. Rental agencies and taxis are plentiful, and you'll be spoilt for choice with our recommendations on the best places to visit, beaches to explore, and things to do. If you’re comfortable driving on the left, and want to explore the island under your own steam then renting a car is an excellent choice. There are a number of reputable car hire firms including Avis, Dollar, Marshalls, Budget, Economy, and the island’s favourite Andy’s. All of the major car hire kiosks are located at the airport. A driving permit is mandatory if you rent a car. All car rental companies are required by law to issue this permit. The fee is US$7.50. Car rental prices depend on the season, with the highest rates between mid-December and mid-April. In the low season, prices are often reduced by around 35%. The speed limit is 30 mph in built-up areas such as George Town and along Seven Mile Beach, and 40 mph on most other roads. Gas prices are published at www.planning.gov.ky. Stations charge more or less the same prices, ranging from CI$3 to CI$4 per gallon. Taxis are informative and friendly, and plentiful at the airport and in front of the cruise ship terminals in George Town. You'll also find them parked in front of the major resorts along Seven Mile Beach. For the most part, drivers are among the most honest you are likely to find in the Caribbean. If you’re shirtless, wet or damp most taxis won’t take you, so make sure to keep a towel with you to stay dry and fresh. The government regulates the taxis, so every driver should have the official government rate sheet. It’s best to agree a price upfront before getting into the cab. You may want to ask to see the official rate sheet. If paying in U.S. dollars, don't expect the driver to accept denominations larger than US$20. Tipping cabbies between 15% and 20% is the local custom. For a fast reliable service we love Ace taxis on +1 345 777 7777. Buses are a great way to get around, although be patient and allow plenty of time. The main island terminal is in George Town next to the Public Library on Edward Street. The main line runs from George Town along Seven Mile Beach every 20 minutes during the day. Bus service runs daily from 6am to midnight, with most fares costing CI$1.50 to CI$3. Buses serve all the main points on the island, including Seven Mile Beach, West Bay, Bodden Town, East End, and North Side. There is no central number to call, since most of the buses are independently operated. Grand Cayman is one of the best Caribbean islands for biking, as its main arteries are relatively flat, decently paved, wide, and properly signposted. If you stick to the coastal route, you'll experience few difficulties except for unexpected downpours. Side roads, however, can be difficult, especially if you're attempting to venture off the beaten track. 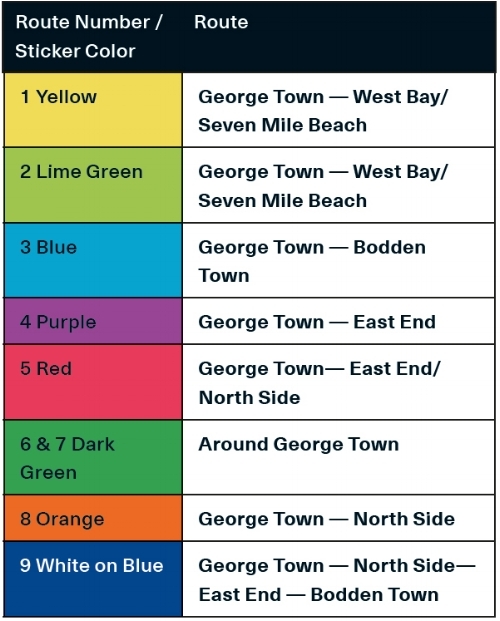 You should avoid the morning and evening rush hours at George Town and along Seven Mile Beach if possible. We love West Bay Loop bike rentals for their prompt service and island-wide delivery. Make the most of the holiday on Easter Monday by enjoying the day at Kaibo’s Cayman Kitefest. Take a Cayman Ferry over for the day and take part in Kaibo’s vision to celebrate Caymanian culture and support the community at the same time. As one of the first stops on the 2019 NORCECA tour, the NORCECA Beach Volleyball Tournament, celebrating its 10th year in Cayman, will be held on Seven Mile Beach and is hosted by the Cayman Islands Volleyball Federation. From the Ritz-Carlton to the Marriott and everything in between Cayman features some of the best brunch experiences in the world. Here is our rundown of some of Cayman’s top brunch spots this Easter. March marked another busy month for Kirk Freeport as the trailblazing of exclusive events continued. This time with the launch of Breitling’s new Premier collection and an intimate meet and greet with Doron Hakimian, president and chief designer of Doves by Doron Paloma at The Westin Grand Cayman. Responsible Living with Mariner Surf Co.
A Brief Chat With Mica Mica Koll and Jonathan Crossan, founders of surfwear brand Mariner Surf Co, on reef safe suncare and caring for the marine and costal environments in the Cayman Islands. Step into a world of stunning colour at the annual Orchid Show and Fundraising Plant Sale. The Queen Elizabeth II Botanic Park, Saturday April 6th and Sunday April 7th from 9:00 AM to 4:30 PM. The Urban Decay launch event arrives in style at Kirk Freeport’s La Parfumerie II. Where better to celebrate the intricate art of diamond jewellery than in Grand Cayman, a country famed for its luxury products and duty free prices. Experience the biggest agricultural show in the calendar; The Cayman Agriculture Show is a showcase for Cayman’s food and farming industry. From The Ritz-Carlton to Cardinal Avenue in George Town, the island’s capital, the Kirkconnell family has been pushing the fine wares envelope from their 22 stores for generations. Stingray City is one of the most magical experiences you can have in the Cayman Islands. Swim, feed, and hold and have your photo taken with these incredible marine animals. Patek Philippe’s unique, one-of-a-kind Travelling Collection arrived in intrepid style at The National Gallery of The Cayman Islands. Discover these highly rated Caymans Islands attractions, including things to do, tours, experiences, maps, and more in Cayman from The Beach.